While browsing in cyberspace, certainly not as smooth as one might imagine, you often find error codes on your internet. 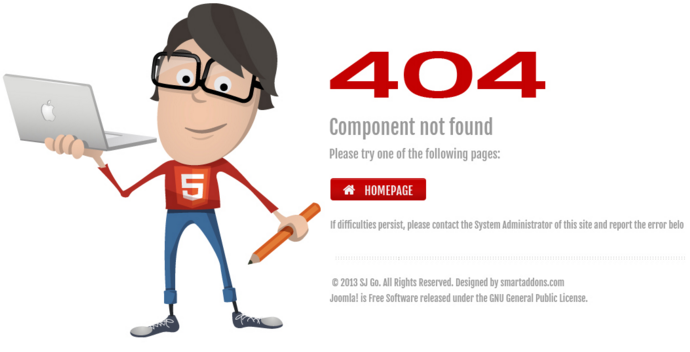 One of the error codes that are popular and often arises is 404 and so on. This error message is actually delivered by a web server that is displayed in your browser. Actually the code is not only an error message, because some are command on both browsers and search engine crawlers. Eg internet error code 301, typically used to permanently remove a web page from the old URL to the new URL. Error 400 This means that the code for Bad requset error. Please check back first when you type a web site address in the address bar of your browser, there may be a mistake in writing the URL or website address and server computers can not recognize your computer request. Error 401 This usually happens if you are in a protected page (unauthorized) or require permissions or login first before heading to the page. In all of the current site will almost automatically ask for a username and password beforehand without displaying a 401 error page. But if your browser displays a 401 error code, do not need to panic, because you are only required to log in or sign in. 403 page will appear if you are opening a page address or hidden (forbidden access) alias is prohibited. That means you are not allowed to be able to access the page by the server. Address directory you typed the URL that actually exist, but the server rejects you or anybody to be able to access the link and protected by a particular program code. This error code 404 may be an error code that is not foreign or often you encounter while browsing using the internet. 404 error page (page not found) will appear if you are opening a page or a page that does not exist, likely that the page has been removed by the site owner so that the website is no longer accessible or server is experiencing problems. This page may be accessed again at any time, if the owner of the site / page is memunculkann your address such access. Error 505 is an error code which shall be performed if the demand / request using a method that is not supported by the server computer. 408 error code is Request Time Out. This means that the server has been disconnected request to the address you typed in the browser because the time is too long. This usually happens if the internet connection is down, so that when a request is up, error 408 will appear. To resolve this error you please repeat the request to refresh the page in the browser to repeat access to the website address you want tersebut.Jika still persists, it means the network provider that you use is not good or is experiencing interference. This error code indicates that the request address of your web site can not continue because it is a conflict on the request. This happens usually when the owner of the site is editing the page you want to access, a request that led to the page will be a conflict and can not be processed by the computer server and client computers. 410 error code indicates that the requested address no longer exists. The page has been permanently deleted and no longer accessible in the future. For example, the main domain of the site is no longer active / expired. But in many cases, the browser will still display the error code "404 Not Found"
This error arises because the requested data request is too besar.Dapat means that the amount of data you want to access exceeds the capacity that can given by the server computer. 414 error code means that you want to access the URL is too long and can not be processed by the server. Currently, this code probably is not going to exist anymore, because the server technology was far more advanced. Error 415 will appear if Randa using media types not supported / allowed by the server. Suppose you upload a PNG image file format, but the server only allows .JPG or .GIF format. Generally, the server will not display this status on your browser when these conditions occur, but only a notice that the image file you uploaded is not appropriate. This error status reused by Twitter, on Twitter Search and Trends API, to let you know that your access is limited / restricted. Generally, other services will display the status of "429 Too Many Request"
Clients are asked to use the newer protocol. Indicates that the user has submitted the request is too much in a certain period. Generally, the server will block IP that is sending too many requests at any given time. This means that access to the website has been blocked by the existing security system in Windows Parental Control Windows Parental Control is useful for blocking sites that are pornographic.